Ernö Dohnányi is the least celebrated of the seminal triumvirate of twentieth-century Hungarian composers; Zoltán Kodály and Béla Bartók have become household names, yet Dohnányi's posthumous fame hangs upon an unrepresentative handful of compositions. This recording brings together three of his finest chamber works; the two masterful yet hugely contrasting Piano Quintets, and his remarkable essay in that most underutilized of instrumental genres, the string trio. The Serenade in C for string trio falls within the direct lineage of models in the genre by Mozart and Beethoven, yet proves a decisive watershed for Dohnányi himself, fully articulating his nationally infused mature style for the first time. The Piano Quintets reflect an enduring and deep-rooted regard for both Brahms and Schumann, and even Mendelssohn. Ernö Dohnányi is the least celebrated of the seminal triumvirate of twentieth-century Hungarian composers; Zoltán Kodály and Béla Bartók have become household names, yet Dohnányi’s posthumous fame hangs upon an unrepresentative handful of compositions. This recording brings together three of his finest chamber works; the two masterful and yet hugely contrasting quintets for piano and strings, and his remarkable essay in that most mistrusted and underutilized of instrumental media, the string trio. Dohnányi’s Serenade in C for string trio fell within the direct lineage of models in the genre by Mozart and Beethoven, yet proved a decisive watershed, fully articulating his nationally infused mature style for the first time. The Piano Quintets, whilst certainly no less accomplished, reflected an enduring and deep-rooted regard for both Brahms and Schumann, and even Mendelssohn. A distinguished conductor, Dohnányi (who revitalized the national identity of Hungarian music after World War I more or less single-handedly) earned universal renown as a formidably gifted virtuoso pianist, regarded by many as the finest that country produced in the post-Lisztian epoch. Ernö (Ernst von) Dohnányi was born on 27 July 1877, the son of a respected amateur cellist of some influence in the musical circles of his native town of Pozsony, scarcely the equal of Budapest or Prague but home, nonetheless, to many capable, if unrecognized musicians. Ernö received early instruction from his father (a kindly, if persistent disciplinarian who recognized the need for solid theoretical grounding) and from the Cathedral organist of Pozsony, Károly Forstner, who supervised the young Dohnányi’s piano tuition until he graduated from the city’s public Gymnasium, his general education completed. Undeterred by a lack of professional tutelage, Dohnányi’s insatiable appetite for all things musical (he had already developed a phenomenal piano technique) naturally impelled him towards a period of formal study at the Academy of Music in Budapest (where he was later joined on the same course by Bartók; the two had known each other since childhood), from which he graduated with honours in 1897. His professors at the Budapest Academy included Thomán and Koessler, though he became a disciple of the influential and charismatic Eugen d’Albert (an archetypal late Romantic piano virtuoso) in his graduation year, spending the summer months working with d’Albert whilst preparing for his professional debut. A year later (in 1898), having attracted the support of the conductor Hans Richter, Dohnányi’s immediate destiny as an itinerant piano virtuoso was assured by a triumphant London debut at which he performed the G major Piano Concerto (No 4), Op 58, by Beethoven, a composer with whom he felt a lifelong spiritual affinity. Dohnányi’s C minor Piano Quintet, the first of almost seventy early works (very few of which merited his rebuke as worthless apprentice efforts) he considered worthy of an opus number, had been completed four years previously; chronology shows it, therefore, to be a student work, yet Brahms endorsed his enthusiasm for the piece by arranging for it to be played in Vienna soon after the premiere, given in Budapest in 1895. The Piano Quintet in C minor, Op 1, is a work of exacting technical prowess, revealing in each of its four movements a temperamental audacity and prodigality of invention far surpassing our normal expectations of any early opus. The work has few direct parallels beyond its apparent sympathies with the Piano Quintets of Schumann and Brahms, but the heady frisson of passions which drives the music forward from the outset is imbued with the invulnerability of youth, as yet little tempered by the burden of experience brought by full maturity. The opening Allegro begins as the piano sets out the broad, ardently mobile first subject idea, which will return to crown the entire work in the coda of the Finale. The strings develop the opening motif in a majestically sonorous, striding unison (if any caveat can be levelled at the Quintet, it might be that Dohnányi’s search for near-orchestral weight of tone leans too persistently on straightforward unison scoring for the string group), which gives way to the cello’s announcement of the relaxed second theme of the exposition. The mood is spacious; broad paragraphs flow majestically towards the beginning of the development, at once more urgent and impulsive, as the strings introduce a tense stretto punctuated by fugal fragments of the first subject, debated over a pulsating piano accompaniment. Roles are reversed as the piano takes over the primary material, supported this time by an uneasily fractured string figure, passed between violins and cello, as mounting rhythmic and harmonic pressures anticipate a massive climax. The recapitulation follows with a jubilant and declamatory unison reprise of the main theme. The coda is supremely self-confident, bringing the movement full-circle in a blaze of tonic-key glory. In the Scherzo, the spectre of a Bohemian ‘furiant’ is thinly concealed behind a brusque, enervated and palpably Brahmsian façade, counterpoised by gentler entreaties in the Trio of near-Schubertian grace and melodic richness. The coda deserves special attention, for it revisits and subtly combines seemingly irreconcilable elements of both Scherzo and Trio. Had the Adagio been from Brahms’s pen, we would not hesitate to describe its mood as autumnal. But Dohnányi’s impulse was deeply personal, and the elegiac character of the principal idea, played by the viola, invests what follows with hushed, reflective poignancy, though the theme itself sounds lovelier still when entrusted to the cello in the closing paragraphs of the movement. The Adagio follows a simple A–B–A ground-plan; the second group brings another quasi-Schubertian idea, initially for strings alone, introduced after a breathtakingly effective modulation. The Finale, a strutting rondo in 5/4 time, takes as its theme a proud Magyar-inspired idea, and is prodigiously imaginative. Note, for example, the discursive fugal passage set in motion by the cello (also given the luxuriant secondary theme of the movement) and the clever use of imitative textures in the episode which follows. But stern academicism gives way once more to the rondo theme, now heard against the backdrop of a Viennese waltz. The coda brings back the opening theme of the entire work, played by the piano and followed immediately by the strings, in preparation for a grandiose reiteration of the Magyar motif. Dohnányi’s Opus 1 ends triumphantly; it could scarcely be otherwise. The final years of the nineteenth century were for Dohnányi a period of consolidation and the advancement of an already prodigious reputation, now founded as much upon growing fame as a composer as his established renown as a concert pianist. 1899 brought a coveted Bösendorfer prize for his Piano Concerto No 1 in E minor, Op 5, composed during 1897/8, and numerous appearances in the musical capitals of Europe and America. A number of major works followed, including the String Quartet No 1 in A, Op 7, a superb though still largely neglected Cello Sonata in B flat minor, Op 8 (both date from 1899), and the impressive Symphony No 1 in D minor, Op 9 (1900/1). Yet the work frequently cited as Dohnányi’s first mature and wholly distinctive piece of chamber music explored one of the least patronized of all genres, the string trio. The Serenade in C major for violin, viola and cello, Op 10, was written in 1902. The string trio medium had enjoyed limited popularity during the eighteenth century, bringing works by Boccherini, Mozart, and Beethoven. Mozart’s great E flat Divertimento, K563 (1788), revealed, probably for the first time, the true potential of the form; not only does the work sound pure and complete, but its textures are full and wide-ranging, even without the second violin, and the music is characterized by a nobility and grandeur far exceeding usual expectations of the undemanding Divertimento idiom. Beethoven’s Op 3 and Op 9 Trios appeared before his early Opus 18 Quartets, in the years 1792 and 1798. His delightful Serenade in D, Op 8, was written in 1797 and contains five movements, complete with the obligatory set of variations. The early Romantic masters (there are string trios by Schubert, Hummel, and others) probably found the notion of string quartet senza second violin hard to accept; after all, how could such a combination convey the philosophical intentions of the post-Beethovenian epoch with any real credibility? Thus very few works for string trio emerged during the years which followed (Dvorák’s delightful Terzetto in C, Op 74, written in 1887, is a hybrid, since it requires two violins and viola), leaving the genre largely untended until the next century. Even then, saving rarities such as Max Reger’s String Trios in A minor, Op 77b, and D minor, Op 141b (1904 and 1915), and the Trio by Jean Françaix (1933), the literature is pitifully small. In his Serenade in C for string trio Dohnányi provided a novel and stylish reworking of the Beethovenian ideal of the Serenade idiom, in a five-movement work of exuberant charm and beauty. The work begins with a March, un-repeated at the close, whereas in Beethoven’s Op 8 the players leave the room in prim, military order and to the theme which had announced their arrival. The second section, a Romance, is disarmingly lyrical and subtle, with evident care taken to allow each instrumental voice to function within its most effectively sonorous register. A mercurial Scherzo, fleet-footed and virtuosic, gives way to the expected Tema con variazioni, a mandatory component of the Classical serenade, and in Dohnányi’s hands ingeniously crafted and frequently offering unexpected harmonic and textural diversions of a very high degree of craftsmanship. Again, the melodic material is equitably shared between the three players before the movement (the longest of the five) reaches a particularly satisfying conclusion. The Finale again pays homage to Viennese Classicism, at least in that Dohnányi chooses to end his Serenade with a movement in rondo form. There any effective comparison with Mozart or Beethoven ends, for the Finale provides compelling evidence to show that Dohnányi’s Op 10 was his most original and distinctive chamber work thus far. The elasticity of thematic material and commanding manipulation of forces throughout the Serenade make it one of the most rewarding and fascinating of all exercises within this marginalized instrumental form. In the years which followed, Dohnányi divided his time between frequent international tours and, throughout a decade commencing in 1905, fulfilled the varied obligations of a professorship at the Hochschule für Musik in Berlin, an appointment which came at the personal invitation of the great violinist Joseph Joachim. Their friendship had resulted from a mutual passion for chamber music; Dohnányi was among the first great piano virtuosi to perform the chamber literature regularly, and his championship of works by the great Classical masters did much to increase their currency and popularity. Whilst several of Dohnányi’s finest compositions (among them the piece which has become his universal calling-card, the Variations on a Nursery Theme for piano and orchestra, Op 25, and the outstanding Suite in F sharp minor, Op 19, possibly Dohnányi’s finest orchestral work) date from the Berlin years, it was his unstinting work in rebuilding Hungary’s native musical traditions which claimed most of his energies on his return to Budapest in 1915; he also maintained his academic post at the Berlin Hochschule as a visiting professor for the next three years. Political life among the Slavic peoples was already locked in ferment and disarray by this time; Dohnányi, though fundamentally a non-aligned libertarian thinker, would himself be drawn into a maelstrom of hatred and recrimination from which his career would not completely recover. Under the aegis of the old, liberally minded and culturally enlightened Republican regime, Dohnányi masterminded a programme of reforms which aimed to breathe new life into Hungary’s battered musical consciousness, first through the many hundreds of concerts he conducted, frequently including premieres of ambitious contemporary works by the young vanguard of Hungarian composers (including Bartók, Kodály, Leó Weiner and others), and, after 1916, through his inspirational piano masterclasses at the Budapest Academy. But just nine months after his appointment to the directorship of the Academy, Hungary’s government fell, to be replaced by a repressive quasi-fascist regime to whom Dohnányi’s liberal viewpoint and reformist aspirations were anathema. In October 1919 the violinist Jenö Hubay succeeded him in Hungary’s pre-eminent musical post, one which carried with it a burden of responsibility far beyond the purely artistic and administrative. Not even an all-out strike by his professorial colleagues could reverse his dismissal, yet Dohnányi’s proselytizing efforts on behalf of Hungary’s music and musicians continued apace, regardless of vindictive and callous tirades against him in the fascist-manipulated press. As principal conductor and artistic director of Hungary’s leading symphony orchestra, that of the Budapest Philharmonic Society, Dohnányi (who was re-appointed to the post for twenty-five uninterrupted years!) continued to promote the works of Hungarian composers, often to the detriment of his own compositions, which were seldom performed in Hungary at the time. Indeed, as his biographer Balint Vázsonyi has suggested in his 1971 study of the composer’s life and works, Dohnányi’s own elevated code of professional ethics and his unstinting moral integrity were attributes which, in the eyes of many, made him culpable. Hungary’s political instability and the outspoken polemics of both right- and left-wing leaders gave little quarter to non-aligned and divergently opinionated intellectuals, particularly those who spoke openly of the impending catastrophe of communism. The Piano Quintet in E flat minor, Op 26, dates from 1914 and is distanced from its predecessor by almost exactly two decades. Though slimmer in proportion (in three rather than four movements, with the conventional Scherzo and slow movement replaced by an Intermezzo), the work is more intense and emotionally concentrated than either of its companions recorded here. A glance at Dohnányi’s output reveals that the Quintet emerged hard on the heels of his Variations on a Nursery Theme and the Suite in the Olden Style for piano solo, Op 24. 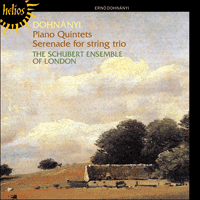 Although written in close proximity, all three works present an unusual polarization of styles, though Dohnányi’s musical language was rarely so dramatically charged as in the case of his second Piano Quintet, an undisputed masterpiece of his maturity. The work was written during the summer and early autumn of 1914, mainly in Berlin where it was first performed on 12 November by the Klinger Quartet with the composer at the piano. Its volatility and urgency reflected Dohnányi’s innate response to the rapidly enveloping turmoil of the period, though in no sense is the work other than wholly abstract in form; indeed, much of its harmonic language is remarkably progressive, and its unique coloration owes something to both the languorous exoticism of Debussy and the radicalism of Schoenberg. But Dohnányi wears modernism with discretion, and even a superficial comparison of his two piano quintets will highlight the depth and gravity, not to mention the greater economy and lucidity of Op 26 to immediate advantage. The work opens in an atmosphere of unsettling mystery as the strings give out a foreboding low-register idea against a hushed piano accompaniment. The main first subject of this Allegro non troppo (which has echoes, surely, of Rachmaninov) is elastic and powerful, its inner tensions deliberately repressed, though made more public and palpable when developed fully after the viola’s triplet figure anticipates a new episode, in which the piano becomes the dominant and heroic protagonist. A new subsidiary idea of more lyrical and expansive character is debated in increasingly chromatic dialogue between piano and strings, and the development section itself is remarkable for its concentration, though the music has assumed stronger nationalistic identity than noted previously, except perhaps in the Finale of Op 1. The recapitulation, too, is abrupt and thoroughly impassioned. Although the traditional Scherzo and slow movement have been replaced by an Intermezzo, the weighty issues explored in the opening movement remain unresolved until addressed afresh in the Finale, and so the middle movement does not provide the psychological foil to the movements it appears to bridge. Instead, the restless atmosphere of the opening Allegro imbues the nostalgic, unmistakably Viennese gait of the Intermezzo with unexpected reserve, even as the viola gives out the principal theme of the movement. There follows a free exploration of this, and several other motifs, juxtaposing sinuously reflective material with passages of more assertive character, though existing anxieties are never deeply concealed. The Finale opens with a sombre, slowly evolving canon announced by the cello and gradually developed contrapuntally by the other string voices, striking an immediately tragic and regretful note. The piano appears with a solemn and valedictorily charged chorale, and these two elements provide the core material for the entire movement. Free development involves the speeding up of the canonic theme from the start of the movement, and the seething complexity of Dohnányi’s scoring now fully reveals the modernism of this episode to full effect; the influence of Schoenberg’s style is plainly evident. But the tragic and pessimistic aspect of the music gives way to a mood of expansive optimism in a coda of splendid affirmation, all doubt being banished during the cathartically triumphant final pages of the work. Dohnányi’s international career continued to develop and, far removed from the power struggles at home, his annual tours as pianist and conductor won him affectionate acclaim in the United States where, in 1927, he accepted the music directorship of the New York State Symphony Orchestra. He did, however, return to Budapest in 1928 to teach piano and composition, becoming musical director of Hungarian Radio three years later. The ’30s and ’40s brought personal torment and public censure; a succession of chronic maladies, some serious and prolonged, brought a decline in overseas appearances, whilst Dohnányi’s protests at anti-semitism hastened his resignation from the Budapest Academy in 1941. But he continued to excite the suspicion of the authorities through his unstinting loyalty to the large Jewish contingent within the Budapest Philharmonic, valiantly sustained until the orchestra was disbanded several months after German forces overran Hungary. Two years after the end of the war, Dohnányi was poised to revive his international career, only to be thwarted by family obligations which led to resettlement in Argentina (as head of the piano department of the faculty of music at the University of Tucuman) before becoming composer-in-residence and professor of piano at Florida State University, Tallahassee, in September 1949. He made his last appearance in the British Isles during the 1956 Edinburgh Festival, though his influence long continued to be felt through the work of several generations of musicians fortunate enough to have studied with him, among them Sir Georg Solti, pianists Annie Fischer and Geza Anda, and his own grandson, the conductor Christoph von Dohnányi. Yet as Bartók noted, it was Dohnányi who gave back to his native Hungary its formerly proud musical heritage, placing other mens’ works before his own and probably sealing his own fate as a composer in the process. Ernö Dohnányi demeure le moins apprécié parmi le trio des principaux compositeurs hongrois du vingtième siècle: tout le monde connaît Zoltán Kodály et Béla Bartók. Pourtant la renommée posthume de Dohnányi tient à une poignée de compositions peu représentatives de sa production. Cet enregistrement rassemble trois de ses œuvres de musique de chambre les plus achevées, les deux Quintettes pour piano avec cordes, pièces magistrales tout en contraste, et le Trio à cordes, qui représente un achèvement remarquable dans cette formation instrumentale peu exploitée et souvent déconsidérée. La Sérénade en ut pour trio à cordes, tout en restant dans la directe continuité des modèles du genre établis par Mozart et Beethoven, marque pourtant un tournant décisif en exprimant clairement pour la première fois son style de maturité emprunt de conscience nationale. Les Quintettes pour piano avec cordes, pas moins élaborés, reflètent une influence profonde et persistante de Brahms et Robert Schumann, voire même de Mendelssohn. Chef d’orchestre respecté, Dohnányi (qui, après la première guerre mondiale, a été l’instigateur plus ou moins solitaire du renouveau d’une musique hongroise proprement nationale) a reçu une renommée universelle comme virtuose du piano formidablement doué, regardé par beaucoup comme le meilleur que ce pays ait produit après Liszt. Né le 27 juillet 1877, Ernö (Ernst von) Dohnányi est le fils d’un violoncelliste amateur respecté des cercles musicaux de sa ville, Pozsony, ni Prague ni Budapest certes, mais ville natale de nombreux musiciens talentueux, quoique méconnus. L’instruction musicale d’Ernö commença de bonne heure grâce à son père (homme bon et soucieux de constante discipline, reconnaissant le besoin d’une base théorique solide) et à Károly Forstner, titulaire des orgues de la cathédrale de Pozsony, qui dirigea ses leçons de piano jusqu’à l’obtention du diplôme du Gymnasium municipal marquant l’achèvement de son éducation générale. Peu soucieux du manque d’encadrement professionnel, l’insatiable appétit de Dohnányi pour tout ce qui tient du domaine musical (il avait déjà développé une technique pianistique phénoménale) le porta naturellement vers la poursuite de ses études à l’Académie royale de musique de Budapest (Bartók l’y rejoignit par la suite dans la même classe; les deux se connaissaient depuis la petite enfance), il obtint son diplôme avec honneurs en 1897. Thomán et Koessler firent partie de ses professeurs à l’Académie de Budapest. Durant sa dernière année d’étude, Ernö devint disciple d’Eugen d’Albert, personnage influent et charismatique, un des derniers exemples des virtuoses du piano romantique. Il passa l’été à travailler sous sa direction tout en se préparant à entamer sa carrière professionnelle. Un an après (en 1898), avec le soutien du chef d’orchestre Hans Richter, Dohnányi fut immédiatement propulsé vers la destinée des pianistes virtuoses itinérants grâce au succès triomphal de ses débuts à Londres, où il joua le Concerto pour piano nº 4 en sol majeur, op. 58 de Beethoven. Il cultiva une affinité spirituelle avec ce compositeur sa vie durant. Le Quintette pour piano avec cordes en ut mineur est la première des quelques soixante-dix compositions de jeunesse qu’il considéra digne de recevoir un numéro d’opus. Peu d’entre elles méritèrent ses reproches de n’être que les efforts inutiles d’un apprenti. Achevé quatre ans auparavant, alors qu’Ernö était encore un étudiant, ce Quintette reçut l’appui enthousiaste de Brahms qui veillat à ce qu’il fût joué à Vienne aussitôt la première donnée à Budapest en 1895. Le Quintette pour piano en ut mineur, op. 1 est une œuvre d’une grande habileté technique, révèlant dans chacun de ses quatre mouvements une audacité originale et une prodigalité d’inventions surpassant de loin ce que l’on peut attendre habituellement d’un premier numéro d’opus. Au delà de ses affinités visibles pour les quintettes pour piano avec cordes de Schumann et de Brahms, cette œuvre comporte peu d’autres influences directes; mais le frisson enivrant des passions, qui d’emblée guide la musique, est empli de l’invulnérabilité de la jeunesse, seulement légèrement voilée par le poids que l’expérience de la maturité apporte. L’Allegro introductif débute par le piano qui présente l’idée large, ardemment mobile du premier thème. Il réapparaîtra pour couronner la pièce entière dans la coda du Finale. Les cordes développent le motif introductif en un unisson sonore et majestueux (si on peut éventuellement former une critique, c’est peut-être que Dohnányi dans sa recherche d’une sonorité de masse quasi orchestrale, s’appuie trop souvent sur une simple orchestration d’unissons aux cordes), qui conduit à l’énoncé au violoncelle du second thème de l’exposition, d’une humeur détendue. Au début du développement, l’atmosphère est spacieuse; de larges paragraphes s’écoulent majestueusement, puis un sentiment impulsif d’urgence se fait jour quand les cordes introduisent un stretto tendu, ponctué de fragments fugués du premier thème, discutés sur le rythme palpitant de l’accompagnement du piano. Les rôles sont inversés quand le piano s’empare du matériel initial, soutenu cette fois par les motifs anxieusement brisés des cordes, échangés entre les violons et le violoncelle. Les tensions rythmiques et harmoniques croissantes laissent anticiper un climax impressionnant. La réexposition s’ensuit avec un unisson jubilant et déclamatoire reprenant le thème principal. La coda est d’une confiance sans égale, achevant le mouvement dans un glorieux flamboiement à la tonalité de tonique. Dans le Scherzo, le fantôme de la «Furiant» de Bohême est légèrement dissimulé derrière la façade brusque, décrépie et pourtant palpable de Brahms, équilibrée par les douces prières du Trio à la grâce et aux richesses mélodiques toutes schubertiennes. La coda mérite une attention particulière, car elle revisite et combine subtilement les éléments apparemment inconciliables du Scherzo et du Trio réunis. Si l’Adagio avait été de la plume de Brahms, nous n’aurions pas hésité un instant à décrire son humeur comme automnale. Mais l’impulsion si personnelle de Dohnányi et le caractère élégiaque de l’idée principale, jouée par l’alto, libèrent une émotion poignante, pensive et profonde; le thème lui-même sonne de manière encore plus charmante quand il est repris au violoncelle dans les derniers paragraphes du mouvement. Durant l’Adagio suivant, de structure simple A–B–A, la seconde partie, introduite après une modulation à couper le souffle, apporte une autre idée quasi-schubertienne initiallement aux cordes seules. Le Finale, un rondeau à 5/4 choisissant pour thème une idée d’inspiration magyare qui parade avec fierté, est prodigieusement imaginatif. Prenons note, par exemple, du passage discursif fugué lancé par le violoncelle (également du second thème luxuriant du mouvement) et de l’emploi intelligent des textures imitatives de l’épisode suivant. Le strict académisme recule encore une fois devant le thème du rondeau, se faisant maintenant entendre avec une valse viennoise en toile de fond. La coda introduit à nouveau le thème initial de l’œuvre entière, joué d’abord au piano puis immédiatement repris aux cordes, en préparation d’une réitération grandiose du motif magyar. L’opus 1 de Dohnányi s’achève triomphalement, il pouvait difficilement en être autrement. Les dernières années du dix-neuvième siècle furent pour Dohnányi une période de consolidation et de développement de sa réputation déjà prodigieuse, alors fondée aussi bien sur sa célébrité croissante de compositeur que sur sa renommée bien établie de concertiste. L’année 1899 le vit d’une part recevoir le prix extrêmement convoité de Bösendorfer pour son premier Concerto pour piano en mi mineur op. 5, composé durant 1897/8 et d’autre part faire de nombreuses apparitions dans les capitales musicales d’Europe et d’Amérique. S’ensuivit la composition d’un certain nombre de pièces majeures, avec le Quatuor à cordes nº 1 en la majeur op. 7, une Sonate pour violoncelle en si bémol mineur op. 8 superbe, quoique largement négligée (tous deux datent de 1899), et la Symphonie nº 1 en ré mineur op. 9 (1900/1) impressionnante. Pourtant l’œuvre régulièrement citée comme la première composition de maturité et comme pièce distinctive à part entière de musique de chambre explore un des genres les moins fréquents du répertoire, le trio à cordes. La Sérénade en ut majeur pour violon, alto et violoncelle, op. 10 a été écrite en 1902. La formation de trio à cordes avait reçu une popularité limitée au dix-huitième siècle, avec des œuvres de Boccherini, Mozart et Beethoven. L’extraordinaire Divertissement en mi bémol K563 de Mozart (1788) révèla probablement pour la première fois le véritable potentiel de cette forme. Non seulement cette œuvre possède une sonorité pure et complète, mais ses textures sont pleines et amples, même sans l’apport d’un second violon. La musique est caractérisée par une noblesse et une grandeur excédant largement les attentes habituelles du style facile de divertissement. Les Trios opp. 3 et 9 de Beethoven apparurent dans les années 1792 et 1798 avant les quatuors de jeunesse op. 18. Sa délicieuse Sérénade en ré majeur op. 8, fut écrite en 1797 et contient cinq mouvements, dont l’inévitable thème et variations. Les maîtres du début de l’époque romantique (il existe des trios à cordes de Schubert, Hummel et d’autres) ont dû trouver la notion de quatuor à cordes senza second violon difficile à accepter. Après tout, comment une telle combinaison aurait-elle pu convoyer avec une vraie crédibilité les intentions philosophiques de l’époque postérieure à Beethoven? Ainsi très peu de pièces pour trio à cordes furent ultérieurement écrites (le charmant Terzetto en ut, op. 74 de Dvorák, écrit en 1887, est un hybride puisqu’il requiert deux violons et un alto), laissant le genre clairement inexploité jusqu’au siècle suivant. Le répertoire demeure toutefois misérablement réduit, malgré quelques raretés comme les Trios à cordes en la mineur op. 77b (1904) et en ré mineur op. 141b (1915) de Max Reger, et le Trio de Jean Françaix (1933). Dans sa Sérénade en ut pour trio à cordes Dohnányi fit montre d’un remaniement stylistique nouveau de l’idéal beethovénien du langage de la sérénade, dans une œuvre en cinq mouvements au charme et à la beauté exubérants. La pièce débute par une Marche, sans répétition au final, tandis que dans l’op. 8 de Beethoven, les instrumentistes quittent la pièce en un ordre militaire impeccable sur le thème qui avait annoncé leur arrivée. La seconde section, une Romance, au lyrisme subtil et touchant, est conçue avec un soin évident afin de permettre à chaque voix instrumentale de fonctionner dans son registre sonore le plus efficace. Un Scherzo versatile, rapide et virtuose, fait place au Tema con variazioni tant attendu, élément obligatoire de la sérénade classique et qui, entre les mains habiles de Dohnányi, offre des diversions harmoniques et des textures inattendues. À nouveau le matériel mélodique est équitablement partagé entre les trois interprètes, avant que le mouvement (le plus long des cinq) n’atteigne une conclusion particulièrement satisfaisante. Le Finale rend hommage au classicisme viennois, par le fait même que Dohnányi ait choisi de finir sa Sérénade avec un mouvement de forme Rondeau. Ici s’achève la comparaison avec Mozart et Beethoven, car dans le Finale résident les preuves indiscutables de l’originalité et la singularité de l’opus 10 qui en font l’œuvre pour musique de chambre la plus aboutie de Dohnányi. La souplesse du matériel thématique et la manipulation des tensions tout au long de la Sérénade en font un exercice des plus gratifiants et fascinants dans cette forme instrumentale marginalisée. Dans les années qui suivirent, Dohnányi divisa son temps entre des tournées internationales fréquentes et ses obligations de professeurs à la Hochschule für Musik de Berlin, un poste obtenu à l’invitation personnelle du grand violoniste Joseph Joachim qu’il occupa durant une dizaine d’années à partir de 1905. Leur amitié provenait d’une passion mutuelle pour la musique de chambre; Dohnányi fut le premier grand virtuose du piano à exécuter régulièrement le répertoire de musique de chambre en public, et son soutien envers les œuvres des maîtres classiques fut pour beaucoup dans l’extension de leur popularité. Les meilleures compositions de Dohnányi (parmi lesquelle la pièce qui est devenue sa carte de visite universelle les Variations sur une chanson enfantine pour piano et orchestre, op. 25 et l’extraordinaire Suite en fa dièse mineur op. 19, qui est peut-être la meilleure œuvre orchestrale de Dohnányi) datent de ses années berlinoises. C’est son travail incessant pour la reconstruction des traditions musicales de sa Hongrie natale qui mobilisa la plus grande partie de son énergie lors de son retour à Budapest en 1915; il garda néanmoins son titre de professeur invité à la Hochschule de Berlin pour les trois années consécutives. La vie politique contemporaine des peuples slaves était déja plongée dans l’agitation et le désarroi. Dohnányi, quoiqu’étant un libre penseur fondamentalement indépendant, se trouva lui-même engagé dans une tempête de haine et de récriminations, dont sa carrière ne se remit jamais tout à fait. Sous les auspices du vieux régime républicain, éclairé et libéral, Dohnányi avait conçu un programme de réformes ayant pour but de revitaliser la conscience musicale hongroise meurtrie: d’abord grâce à une série de centaines de concerts qu’il dirigea, comprenant souvent des ambitieuses premières d’œuvres contemporaines de la jeune avant-garde de compositeurs hongrois (Bartók, Kodály, Leó Weiner et d’autres) et, après 1916, à travers l’inspiration de master-classes de piano à l’Académie de musique de Budapest. Mais le neuvième mois seulement de sa nomination à la direction de l’Académie vit la chute du gouvernement hongrois remplacé par un régime répressif pratiquement fasciste, qui considéra comme un véritable anathème sa conception libérale et ses aspirations réformistes. En Octobre 1919, le violoniste Jenö Hubay le remplaça au poste le plus influent de Hongrie, poste qui impliquait une charge de responsabilités beaucoup plus importante que celles purement artistiques et musicales. Pas même une grève totale du corps enseignant ne put empêcher sa révocation. Il poursuivit pourtant avec dilligence ses efforts prosélytiques pour la musique et les musiciens hongrois, sans un regard pour les jugements vindicatifs et impitoyables publiés à son égard dans la presse ouvertement manipulée par le régime fasciste. Comme premier chef et directeur artistique de l’orchestre symphonique le plus en vue, celui de la Société Philharmonique de Budapest, Dohnányi (qui fut réélu à sa tête pendant vingt-cinq années consécutives) continua à favoriser les œuvres de compositeurs hongrois, souvent au détriment de ses propres compositions, qui, durant cette période, furent rarement exécutées en Hongrie. Ainsi, selon la suggestion de son biographe Balint Vázsonyi dans son étude de 1971 sur sa vie et son œuvre, son code élevé de l’éthique professionnelle et son intégrité morale sans compromis furent des raisons qui, aux yeux de beaucoup, firent de lui un coupable. L’instabilité politique hongroise et les franches polémiques des leaders aussi bien de la droite que de la gauche laissaient peu de place pour des intellectuels non-alignés, d’opinion divergentes, particulièrement pour ceux prédisant ouvertement la catastrophe prochaine du communisme. Le Quintette pour piano en mi bémol mineur, op. 26 date de 1914 et est séparé de presque deux dizaines d’années de son prédécesseur. Quoique de proportions plus réduites (en trois plutôt qu’en quatre mouvements, avec le Scherzo conventionnel et le mouvement lent remplacés par un Intermezzo), l’œuvre est plus intense et contient une émotion plus concentrée que celle des autres pièces présentes dans cet enregistrement. Un rapide coup d’œil dans la production de Dohnányi révèle que ce Quintette fut conçu immédiatement après ses Variations sur une chanson enfantine, op. 25 et sa Suite en style ancien pour piano solo, op. 24. Ces trois compositions, bien qu’ayant été écrites à une période concomitante, présentent une polarisation inhabituelle des styles; le langage musical de Dohnányi a rarement été aussi fort dramatiquement que dans le cas de son second Quintette pour piano avec cordes, qui demeure indiscutablement un chef-d’œuvre de sa maturité. Cette pièce fut écrite durant l’été et le début de l’automne 1914 à Berlin principalement, où elle fut exécutée pour la première fois le 12 novembre, par le Quatuor Klinger, avec le compositeur au piano. La réponse naturelle de Dohnányi à l’agitation grandissante de cette période se reflète dans le sentiment d’instabilité et d’urgence présent dans cette œuvre, qui demeure pourtant de forme entièrement abstraite. En effet son langage harmonique est remarquablement progressiste et sa couleur unique est redevable à la fois à l’exotisme langoureux de Debussy et au radicalisme de Schoenberg. Mais Dohnányi porte le modernisme avec discrétion et une comparaison même superficielle entre ses deux Quintettes pour piano avec cordes soulignera la profondeur, la gravité et la lucidité, pour ne pas mentionner une plus grande économie de moyens de l’op. 26. Cette composition s’ouvre dans une atmosphère troublante de mystère où les cordes émettent une idée pleine de pressentiments dans le registre grave, sur un accompagnement étouffé du piano. Le premier thème de cet Allegro non troppo qui contient sûrement des échos de Rachmaninov, est souple et puissant; ses tensions internes, d’abord volontairement contenues, se font sentir de manière plus palpable durant leur développement qui intervient après que l’alto ait anticipé, dans des motifs en triolet, un nouvel épisode où le piano deviendra le protagoniste héroïque et dominant. Une nouvelle idée secondaire au caractère expansif et lyrique est discutée entre piano et cordes dans un dialogue de plus en plus chromatique. La section de développement est remarquable de concentration. La musique assume une identité nationale plus importante que précédemment, à l’exception peut-être du Finale de l’op. 1. La réexposition est également abrupte et passionnée. Bien que le Scherzo traditionnel et le mouvement lent aient été remplacés par un Intermezzo, les questions fondamentales explorées dans le premier mouvement demeurent sans réponse jusqu’à leur réapparition dans le Finale. Ainsi le mouvement central ne fournit pas le contraste psychologique aux mouvements qu’il semble devoir relier. Au contraire, l’atmosphère agitée de l’Allegro introductif colore l’allure nostalgique indéniablement viennoise de l’Intermezzo d’une retenue inattendue, même durant l’exposition du thème principal du mouvement à l’alto. S’ensuit une exploration libre de cette mélodie, ainsi que d’autres motifs, juxtaposant sinueusement un matériel de nature songeuse avec des passages de caractère plus tranchant. Les angoisses existantes ne disparaissent jamais tout à fait. Le Finale s’ouvre par un canon sombre, se mouvant lentement, énoncé au violoncelle et développé petit à petit en contrepoint aux autres cordes, faisant immédiatement résonner une note tragique, pleine de regrets. Le piano apparaît avec un choral solennel, chargé d’adieux. Ces deux éléments fournissent le matériel central du mouvement entier. Le développement libre voit le thème canonique initial s’accélérer tandis que la complexité bouillonnante de la mise en partition de Dohnányi révèle pleinement l’effet produit par le modernisme de ce passage; l’influence du style de Schoenberg est complètement évidente. L’aspect tragique et pessimiste de la musique laisse place à une humeur d’un optimisme communicatif dans une coda à l’affirmation splendide. Tout doute est finalement banni avec le triomphe cathartique des dernières pages de cette œuvre. Ernö Dohnányi poursuivit sa carrière internationale. Loin des luttes politiques de son pays, ses tournées annuelles de pianiste et de chef-d’orchestre lui apportèrent une reconnaissance affectueuse aux États-Unis où il accepta, en 1927, le poste de directeur musical de l’Orchestre Symphonique de l’État de New-York. Il retourna néanmoins à Budapest en 1928 pour enseigner le piano et la composition et devint directeur musical de la Radio hongroise trois ans plus tard. Les années 30 et 40 furent source de tourments personnels et de censure publique; une succession de maladies chroniques, quelques unes longues et sérieuses, le retint éloigné de la scène internationale, tandis que ses protestations contre l’antisémitisme précipitèrent sa démission de l’Académie de musique de Budapest en 1941. Il continua à exciter les soupçons des autorités par sa loyauté indéfectible envers les nombreux membres d’origine juive de l’Orchestre Philharmonique de Budapest, les soutenant avec vaillance jusqu’à la dissolution de l’orchestre quelques mois après l’invasion allemande de la Hongrie. Deux ans après la fin de la guerre, Dohnányi était prêt à reprendre sa carrière internationale, seulement pour être contrarié par des obligations familiales qui l’amenèrent à s’établir en Argentine (comme directeur du département de piano à la Faculté de musique de l’Université de Tucuman) avant de devenir compositeur en résidence et professeur de piano à Tallahassee, l’université d’État de Floride, en septembre 1949. Il apparut pour la dernière fois en Grande-Bretagne au festival d’Édimbourg en 1956. Son influence se fait toutefois encore sentir à travers quelques générations de musiciens qui ont eu la chance de pourvoir étudier sous sa direction. Parmi eux nous pouvons citer Sir Georg Solti, les pianistes Annie Fischer et Geza Anda, et son propre petit-fils le chef d’orchestre Christoph von Dohnányi. Comme Bartók le faisait remarquer, c’est Dohnányi qui a redonné à sa Hongrie natale la fierté de son héritage musical, plaçant les œuvres d’autres hommes avant les siennes et scellant par là même son propre destin de compositeur. Von einem einflußreichen Triumvirat ungarischer Komponisten des zwanzigsten Jahrhunderts war Ernst von Dohnányi der am wenigsten bekannte. Sowohl Zoltán Kodály als auch Béla Bartók sind allen ein Begriff, wogegen sich der postume Ruhm Dohnáyis auf eine nicht repräsentative Handvoll Kompositionen stützt. Diese Aufnahme vereint drei seiner schönsten Kammermusikwerke; die beiden meisterhaften und doch außerordentlich gegensätzlichen Quintette für Klavier und Streichquartett und sein bemerkenswertes Essay in dem am meisten angezweifelten und vernachlässigten aller instrumentalen Medien, dem Streichtrio. Dohnányis Serenade in C-Dur für Streichtrio schloß sich in direkter Linie den Vorlagen dieses Genres von Mozart und Beethoven an und markierte durch seinen erstmals uneingeschränkt ausgedrückten reifen, nationalen Stil gleichwohl einen entscheidenden Wendepunkt. Die in keiner Hinsicht weniger vollendeten Klavierquintette spiegelten eine anhaltende und tiefverankerte Achtung vor sowohl Brahms als auch Robert Schumann und selbst Mendelssohn wider. Nicht nur ein erstklassiger Dirigent, Dohnányi (der die nationale Identität der ungarischen Musik nach dem Ersten Weltkrieg mehr oder weniger eigenhändig neu belebte) wurde auch als Klaviervirtuose von beachtlicher Begabung weitverbreitetes Ansehen zuteil. Von vielen wird er als der Beste angesehen, dessen Ungarn sich in der Epoche nach Liszt rühmen konnte. Ernö (Ernst von) Dohnányi war am 27. Juli 1877 als Sohn eines anerkannten Amateurcellisten geboren worden, der in den Musikkreisen seiner Geburtsstadt Pozsony einigen Einfluß besaß. Pozsony konnte sich zwar kaum mit Budapest oder Prag messen, war aber trotzdem Wohnort vieler begabter, wenn auch unbekannter, Musiker. Ernst erhielt schon früh von seinem Vater Unterricht (ein freundlicher, jedoch beharrlicher Lehrmeister, der den Bedarf an solidem, theoretischen Grundwissen erkannte). Der Organist des Doms von Pozsony, Károly Forstner, leitete den Klavierunterricht des jungen Dohnányi, bis dieser seine Allgemeinbildung am öffentlichen Gymnasium der Stadt abschloß. Von seinem Mangel an professioneller Schulung keineswegs entmutigt, trieb ihn sein unersättlicher Appetit nach allem, was auch nur entfernt mit Musik verbunden war (er hatte bereits eine phänomenale Klaviertechnik entwickelt) natürlich in eine Periode offizieller Studien an der Akademie für Musik in Budapest (wo Bartók sich ihm später zugesellte; die beiden hatten sich seit ihrer Kindheit gekannt), wo er 1897 mit Auszeichnung abschloß. Seine Professoren an der Budapester Akademie waren unter anderem Thomán und Koessler; er schloß sich in seinem letzten Jahr indes dem einflußreichen und charismatischen Virtuosen Eugen d’Albert (ein typischer Klaviervirtuose der Spätromantik) an, mit dem er die Sommermonate verbrachte, um sein professionelles Debüt vorzubereiten. Ein Jahr darauf (1898) hatte er die Unterstützung des Dirigenten Hans Richter erhalten, und Dohnányis unmittelbare Laufbahn als reisender Klaviervirtuose wurde von seinem triumphalen Debüt in London gesichert, bei dem er das Klavierkonzert in G-Dur (Nr. 4), Op. 58 von Beethoven spielte, einem Komponisten, mit dem er sich sein ganzes Leben lang geistig verbunden fühlen sollte. Dohnányis Klavierquintett in c-Moll, das erste von beinahe siebzig frühen Werken (von denen sehr wenige sein Urteil als wertlose Anstrengungen eines Schülers verdienten), das er als einer Opusnummer wert betrachtete, war vier Jahre zuvor vollendet worden; chronologisch gesehen ist es deshalb das Werk eines Studenten, und doch bekundete Brahms seine Begeisterung für das Stück, indem er kurz nach dessen Première 1895 in Budapest seine Aufführung in Wien organisierte. Das Klavierquintett in c-Moll, Op. 1 ist ein Werk anspruchsvoller, technischer Fähigkeiten, das in jedem seiner vier Sätze eine temperamentvolle Kühnheit und eine Fülle an Invention zum Ausdruck bringt, die unsere allgemeinen Erwartungen an ein frühes Opus weit übertreffen. Abgesehen von seiner unverkennbaren Ähnlichkeit nüt den Klavierquintetten von Schumann und Brahms, hat das Werk wenige direkte Parallelen, der berauschende frisson (Schauer) der Leidenschaften, der die Musik von Anfang an vorantreibt, ist von jugendlicher Unverletzlichkeit durchtränkt, die von der Erfahrungslast der vollen Reife kaum berührt wird. Im eröffnenden Allegro stellt das Klavier die erste, breite, leidenschaftlich lebhafte thematische Idee vor, die schließlich als krönender Abschluß in der Coda des Finales wiederkehren wird. Die Streicher entwickeln das einleitende Motiv in eine majestätisch wohlklingende Einheit (könnte auch nur der geringste Vorbehalt im Hinblick auf das Quintett erhoben werden, wäre es, daß die Suche Dohnányis nach orchesterähnlicher Klangschwere sich mit zu großer Beharrlichkeit auf eine einfache, einheitliche Instrumentierung der Streicher stützt), die dem Cello weicht, das die entspannte zweite Melodie der Themenaufstellung ankündigt. Die Stimmung drückt Weitläufigkeit aus; majestätisch fließend führen breite Abschnitte zum Beginn der Durchführung, die sofort drängender und impulsiver wird, wenn die Streicher ein spannungsgeladenes stretto einführen, das durch fugale Fragmente des ersten Themas, über eine pulsierende Klavierbegleitung ausgebreitet, betont ist. Indem das Klavier das Hauptmaterial übernimmt, werden die Rollen getauscht. Nun liefert eine unruhig gebrochene Streicherfigur, gespielt von Violinen und Cello, die Unterstützung, indem der rhythmische und harmonische Druck steigt und einen massiven Höhepunkt vorausahnen läßt. Hiernach folgt die Zusammenfassung in Gestalt einer jubilierenden und pathetischen einstimmigen Reprise des Hauptthemas. Die Coda ist höchst selbstbewußt und schließt mit Glanz und Gloria den Kreis der Sätze in der Grundtonart. Im Scherzo birgt eine brüske, entkräftete und eindeutig Brahmssche Fassade die Andeutung eines böhmischen „Furiant“, der von den sanfteren, flehenden Bitten des Trios, das von beinahe Schubertscher Grazie und melodischer Pracht ist, ausgeglichen wird. Die Coda verdient besondere Aufmerksamkeit, denn sie kehrt nochmals zu den scheinbar unvereinbaren Elementen des Scherzos und des Trios zurück, und verflechtet diese mit Zartgefühl. Stammte das Adagio aus der Feder Brahms, würden wir, ohne zu zögern, seine Stimmung als herbstlich beschreiben. Dohnányis Leitmotiv war jedoch von tiefgreifender Persönlichkeit, und der elegische Charakter des Hauptthemas, das von der Bratsche gespielt wird, verleiht dem Folgenden eine gedämpfte, nachdenkliche Wehmut, obwohl das eigentliche Thema in den abschließenden Abschnitten des Satzes noch lieblicher erklingt, wenn es nämlich dem Cello anvertraut wird. Das Adagio folgt dem einfachen Grundmuster A–B–A; die zweite Gruppe führt, anfangs nur für Streicher, abermals einen quasi-schubertschen Gedanken mit sich, der nach einer atemberaubend wirkungsvollen Modulation eingeführt wird. Das Finale, ein stolzierendes Rondo im 5/4 Takt, dessen stolze Melodie von Magyar inspiriert ist, ist von außerordentlicher Vorstellungskraft. Beispiele dafür sind die vom Cello angetriebene ausholende, fugale Passage (sowie die luxuriöse Nebenmelodie des Satzes), und die weise Anwendung der imitativen Strukturen im folgenden Zwischenspiel. Strenge Wissenschaft weicht abermals einem Rondothema, das nun vor dem Hintergrund eines Wiener Walzers zu hören ist. Die Coda bringt die Eröffnungsmelodie des gesamten Werkes zurück, die vom Klavier gespielt und nach der die Streicher unmittelbar zum Einsatz kommen, um eine grandiose Wiederholung des Magyar-Motivs vorzubereiten. Dohnányis Op. 1 schließt triumphierend ab: wie hätte es auch anders sein können. Die späten Jahre des Neunzehnten Jahrhunderts waren für Dohnányi eine Periode der Festigung und der Weiterentwicklung eines bereits außerordentlichen Rufs, der nun ebenso sehr auf seiner steigenden Berühmtheit als Komponist wie auf seiner festverankerten Anerkennung als Konzertpianist beruhte. Das Jahr 1899 bescherte ihm den begehrten Bösendorfer Preis für sein erstes Klavierkonzert in e-Moll, Op. 5, das er im Laufe der Jahre 1897/8 komponiert hatte, sowie zahlreiche Auftritte in den musikalischen Hauptstädten Europas und Amerikas. Es folgten nun eine Reihe umfangreicherer Werke, hierunter auch das Streichquartett Nr. 1 in A, Op. 7, eine superbe, dennoch auch heute noch vernachlässigte Cellosonate in b-Moll, Op. 8 (beide aus dem Jahr 1899) und die eindrucksvolle erste Sinfonie in d-Moll, Op. 9 (1900/1). Und doch untersuchte Dohnányi in jenem Werk, das am häufigsten als sein erstes reifes und unverwechselbarstes Werk der Kammermusik bezeichnet wird, die Möglichkeiten eines der am seltensten genutzten aller Genres, des Streichtrios. Die Serenade in C-Dur, Op. 10, wurde 1902 komponiert. Die Popularität des Streichtrios sah sich im achtzehnten Jahrhundert auf wenige Werke von Boccherini, Mozart und Beethoven begrenzt. Mozarts großartiges Divertimento in Es, K563 (1788), offenbarte wahrscheinlich zum ersten Mal das wahre Potential dieses Genres; das Werk hat nicht nur einen reinen und vollendeten Klang, auch die Strukturen sind, selbst ohne die zweite Violine, weitreichend und satt. Die Musik ist ausgezeichnet durch eine Noblesse und Grandeur, die alle gewöhnlichen Erwartungen an das wenig fordernde Divertimento-Idiom bei weitem übertreffen. Beethovens Trios Op. 3 und Op. 9 entstanden 1792 und 1798 vor seinen frühen Quartetten des Opus 18. Seine wunderbare Serenade in D, Op. 8 war 1797 komponiert worden und besteht aus fünf Sätzen einschließlich der obligatorischen Variationsreihe. Für die frühen Meister der Romantik (es gibt Streichtrios von Schubert, Hummel und anderen) war die Vorstellung eines Streichquartetts senza zweite Violine nur schwer annehmbar; wie könnte eine solche Kombination die philosophischen Absichten der Periode nach Beethoven auch nur mit der geringsten Glaubwürdigkeit übermitteln? Somit wurden im Laufe der nächste Jahre (Dvoráks wunderschönes Terzetto in C, Op. 74, komponiert im Jahre 1887, ist eine Art Mischung, denn es ist für zwei Violinen und Bratsche instrumentiert) nur wenige Streichtrios geschaffen, weshalb das Genre bis ins nächste Jahrhundert im großen und ganzen unbeachtet blieb. Und auch nach dem Jahrhundertwechsel sind die Werksverzeichnisse, von einigen Raritäten wie Max Regers Streichtrios in a-Moll, Op. 77b und d-Moll, Op. 141b (1904 und 1915) und dem Trio von Jean Françaix (1933) abgesehen, bedauernswert unzureichend. Mit seiner Serenade in C für Streichtrio, Op. 10, überarbeitete Dohnányi in einem fünfsätzigen Werk von mitreißendem Charme und Reiz das Beethovensche Ideal des Serenadenidioms auf völlig neuartige und stilvolle Weise. Das Werk beginnt mit einem Marsch, der im Finale nicht wiederholt wird, während die Musiker in Beethovens Op. 8 den Saal sittsam militärisch in Reih und Glied zu jenem Thema verlassen, das bereits ihren Einmarsch angekündigt hatte. Der zweite Abschnitt, eine Romanze, ist entwaffnend lyrisch und subtil, indem jeder instrumentalen Stimme mit offensichtlicher Sorgfalt ihr jeweils wirkungsvollstes Klangregister bereitgestellt wird. Ein sprunghaftes Scherzo, leichtfüßig und virtuos, weicht dem erwarteten Tema con variazioni, einem obligatorischen Teil der klassischen Serenade, der in den Händen Dohnányis unbefangen gestaltet wird und wider Erwarten harmonische und strukturelle Ableitungen höchster Kunstfertigkeit darbietet. Abermals wird das melodische Material gerecht auf alle drei Interpreten verteilt, ehe der Satz (der längste der fünf) seinen außerordentlich wohlklingenden Abschluß erreicht. Das Finale ist wiederum eine Hommage an die Wiener Klassik, zumindest insofern, als daß Dohnányi es bevorzugt, seine Serenade mit einem Rondosatz zu beenden. Hier enden alle wirkungsvollen Vergleiche mit Werken Mozarts oder Beethovens, denn das Finale liefert den zwingenden Beweis dafür, daß Dohnányis Op. 10 sein bis zu diesem Zeitpunkt originellstes und unverwechselbarstes Werk in der Kammermusik war. Die Dehnbarkeit des thematischen Materials und die durchweg gebieterische Bearbeitung der Kräfte machen die Serenade zu einem der lohnendsten und faszinierendsten aller Übungsstücke für diese an den Rand gedrängte instrumentale Form. In den darauffolgenden Jahren unternahm Dohnányi häufig Reisen ins Ausland, und ab 1905 kam er über die nächsten zehn Jahre seinen verschiedenen Verpflichtungen als Professor an der Berliner Hochschule für Musik nach, einer Stellung, die er durch die persönliche Aufforderung des berühmten Violinisten Joseph Joachim erhielt. Ihre Freundschaft war aus einer gemeinsamen Leidenschaft für die Kammermusik heraus entstanden; Dohnányi war einer der ersten großen Klaviervirtuosen, die Kammermusikstücke regelmäßig und in öffentlichen Konzerten spielten, und durch seine meisterliche Interpretation von Werken der berühmten klassischen Meister half er, ihre Verbreitung und Beliebtheit zu erhöhen. Während zahlreiche von Dohnányis feinsten Kompositionen (unter ihnen auch das Werk, das zu seiner allgemeinen Visitenkarte wurde, die Variationen über einen Kinderreim für Klavier und Orchester, Op. 25, und die hervorragende Suite in fis-Moll, Op. 19, möglicherweise das beste orchestrale Werk aus der Feder Dohnányis) aus seinen Berliner Jahren stammen, war es seine unermüdliche Arbeit an der Wiederherstellung von Ungarns ursprünglicher Musiktradition, die nach seiner Rückkehr 1915 nach Budapest den Löwenanteil seiner Energie beanspruchte; außerdem hielt er über die nächsten drei Jahre seine Stellung an der Berliner Hochschule als Gastdozent bei. Die politische Atmosphäre unter den slawischen Völkern glich zu dieser Zeit bereits einem Hexenkessel; Dohnányi, der eigentlich im wesentlichen ein bündnisfreier, liberaler Denker war, sollte dennoch in diesen Sog aus Haß und gegenseitigem Beschuldigungen hineingezogen werden, von dem sich seine Karriere nie wieder gänzlich erholen sollte. Unter der Ägide des alten, liberal eingestellten und kulturell aufgeklärten, republikanischen Systems war Dohnányi bei der Entwicklung eines Reformprogramms, das darauf abzielte, dem angeschlagenen, ungarischen Musikbewußtsein neues Lebens zu geben, der führende Kopf. Anfangs dirigierte er viele Hunderte von Konzerten, die oft die Premières der zeitgenössischen Werke von jenen ehrgeizigen und jungen Künstlern waren, die die Spitze der ungarischen Musikszene ausmachten (wie Bartók, Kodály, Leó Weiner und anderen), und zudem stellten nach 1916 seine Meisterkurse an der Budapester Akademie für viele eine Inspirationsquelle dar. Allerdings wurde die ungarische Regierung nur neun Monate nach seiner Ernennung zum Leiter der Akademie gestürzt und von einem repressiven, quasi-faschistischem Regime abgelöst, dem Dohnányis liberale Ansichten und Reformbemühungen ein Stein des Anstoßes waren. Im Oktober 1919 übernahm der Violinist Jenö Hubay seine Stellung als Leiter der Akademie, den überragenden musikalischen Posten Ungarns, mit dem eine Verantwortungslast verbunden war, die über das rein Künstlerische und Administrative weit hinausging. Nicht einmal ein Streik seiner Kollegen konnte seine Verabschiedung verhindern. Dennoch setzte Dohnányi seine bekehrenden Anstrengungen im Namen der Musik und der Musiker Ungarns im selben Tempo unbeirrt fort, ungeachtet der rachsüchtigen und gefühllosen Tiraden, mit denen die von den Faschisten manipulierte Presse ihn überschüttete. Als Hauptdirigent und musikalischer Leiter von Ungarns leitendem Sinfonieorchester, dem der Philharmonischen Gesellschaft Budapest, förderte Dohnányi (der ununterbrochen fünfundzwanzig Jahre lang für diesen Posten wiedergewählt wurde!) auch weiterhin Werke ungarischer Komponisten, oft auf Kosten seiner eigenen Kompositionen, die im damaligen Ungarn nur selten aufgeführt wurden. Denn, wie auch sein Biograph Balint Vázsonyi in einer Studie aus dem Jahre 1971 über das Werk und Leben des Komponisten andeutete, Dohnányis eigene erhabene Norm der Berufsethik und seine vorbehaltlose, moralische Integrität waren Aspekte, die ihn in den Augen vieler schuldig machten. Ungarns politische Instabilität und die unverblümten Polemiken politischer Führer sowohl der Rechten als auch der Linken gewährten bündnislosen und divergent eingestellten Intellektuellen im allgemeinen, und jenen, die offen über die herausziehende Katastrophe des Kommunismus sprachen, im besonderen, wenig Freiraum. Das Klavierquintett in es-Moll, Op. 26, stammt aus dem Jahre 1914, beinahe zwei Jahrzehnte nach seinem letzten Werk mit dieser Besetzung. Obgleich von seinem Aufbau her etwas schmaler (in drei Sätzen anstelle der vier, indem das herkömmliche Scherzo und der langsame Satz von einem Zwischenspiel ersetzt wurden), ist das Werk im Vergleich zu den anderen Stücken dieser Aufnahme wesentlich intensiver und emotional konzentrierter. Ein kurzer Blick auf Dohnányis gesamtes musikalisches Schaffen zeigt, daß das Quintett seinen Variationen über einen Kinderreim, Op. 25 und der Suite im alten Stile für Soloklavier, Op. 24, dicht auf den Fersen war. Obwohl unmittelbar nacheinander geschrieben, vermitteln alle drei Werke eine außergewöhnliche Polarisierung an Stilarten, obwohl Dohnányis musikalischer Ausdruck selten so spannungsgeladen war wie in seinem zweiten Klavierquintett, dem unbestrittenen Meisterwerk seiner Blütezeit. Das Werk war im Laufe des Sommers und Herbstes 1914 größtenteils in Berlin geschrieben worden, wo es am 12. November dann auch vom Klinger Quartett mit dem Komponisten am Klavier uraufgeführt wurde. Seine Unbeständigkeit und sein Drängen spiegelten Dohnányi’s natürliche Reaktion auf die schnell um sich greifende Unruhe dieser Zeit wider, obgleich das Werk in jeder Hinsicht abstrakt ist. Tatsächlich ist ein Großteil seines musikalischen Ausdrucks bemerkenswert progressiv, und seine einzigartige Klangfarbe verdankt sowohl der schmelzenden Exotik Debussys als auch dem Radikalismus Schönbergs einiges. Allerdings zeigt Dohnányi den Modernismus nur diskret, und selbst ein oberflächlicher Vergleich der beiden Klavierquintette wird die Tiefe und Schwere des Opus 26 zu seinem unmittelbaren Vorteil hervorheben, ganz zu schweigen von seiner größeren Sparsamkeit und Klarheit. Das Werk beginnt in einer Atmosphäre unruhiger Geheimniskrämerei, in der die Streicher im tiefen Register bei gedämpfter Klavierbegleitung eine unheilvolle Stimmung heraufbeschwören. Das erste Hauptthema dieses Allegro non troppo (das zweifellos an Rachmaninow erinnert) ist elastisch und kraftvoll, seine inneren Spannungen werden zunächst absichtlich, aber dann, bei deren vollen Ausführung nach einer Einleitung durch eine Bratschentriola, offener und spürbarer. Ein neues, eher lyrisches und weit ausholendes Nebenthema wird mit steigender Chromatik in einem Dialog zwischen Klavier und Streicher behandelt, und der eigentliche Entwicklungsabschnitt ist von seiner Konzentration her beachtenswert. Die Musik strahlt, vielleicht mit Ausnahme des Finale des Op. 1, eine stärkere nationale Identität aus, als bisher angenommen, und auch die Reprise ist abrupt und durch und durch leidenschaftlich. Obgleich sowohl das traditionelle Scherzo als auch der langsame Satz von einem Zwischenspiel ersetzt worden sind, verbleiben die schwerwiegenden Aspekte, die im eröffnenden Satz erforscht werden, bis zu ihrer erneuten Behandlung im Finale ungelöst, weshalb der mittlere Satz für jene Sätze, die er scheinbar verbindet, keinen psychologischen Hintergrund darstellt. Statt dessen durchdringt die ruhelose Stimmung des eröffnenden Allegros das nostalgische, unverkennbar wienerische Tempo des Zwischenspiels mit unerwarteter Zurückhaltung eben zu dem Zeitpunkt, an dem die Bratsche mit dem Hauptthema des Satzes einsetzt. Es folgt eine unbeschwerte Erforschung von diesem und anderer Motive, wobei verschlungen nachdenkliche Passagen neben solche von eher bestimmtem Charakter stehen, obwohl bestehende Bedenken nie groß verborgen werden. Das Finale schlägt mit einem düsteren, sich langsam entwickelnden Kanon einen unmittelbar tragischen und bedauernden Ton an. Der Kanon wird vom Cello angekündigt und nach und nach kontrapunktisch von den anderen Streichinstrumenten weiterentwickelt. Das Klavier setzt mit einem feierlichen Choral ein, der Abschiedsstimmung aufkommen läßt, und diese beiden Elemente bilden das Kernmaterial des gesamten Satzes. Das Tempo des kanonischen Themas des Satzanfangs wird in der freien Entwicklung erhöht, und die schäumende Komplexität von Dohnányis Instrumentierung offenbart nun vollends und äußerst wirkungsvoll den Modernismus dieses Abschnitts: Der Einfluß von Schönbergs Stil ist unübersehbar. Der tragische und pessimistische Aspekt der Musik weicht in einer Coda von glänzender Bejahung jedoch einer Stimmung von ausholendem Optimismus, während auf den letzten, kathartisch triumphalen Seiten des Werkes schließlich jeglicher Zweifel vertrieben wird. Die internationale Karriere des Ernst von Dohnányi entwickelte sich weiter, und fernab von den Machtkämpfen der Heimat bescherten ihm seine jährlichen Konzertreisen als Pianist und Dirigent eine beinahe liebevolle Anerkennung in den Vereinigten Staaten, wo er 1927 die Stellung als musikalischer Leiter des New York State Symphony Orchestra annahm. 1928 kehrte er allerdings nach Budapest zurück, um Klavier und Komposition zu lehren und wurde drei Jahre darauf zum musikalischen Leiter des ungarischen Radios ernannt. Die 30er und 40er Jahre brachten viel persönliches Leid und öffentliche Zensur mit sich; eine Reihenfolge chronischer, zum Teil langwieriger Krankheiten zwang ihn dazu, die Zahl seiner Auftritte im Ausland zu verringern. Dohnányis Eintreten gegen den Antisemitismus beschleunigte indes auch seinen Rücktritt von der Budapester Akademie im Jahre 1941. Wegen seiner vorbehaltlosen Loyalität jüdischen Kollegen der Budapester Philharmonie gegenüber erregte er jedoch auch weiterhin den Argwohn der Behörden und hielt tapfer aus, bis das Orchester schließlich einige Monate nach dem Einmarsch der deutschen Armee in Ungarn aufgelöst wurde. Zwei Jahre nach Kriegsende war Dohnányi dann zur Wiederaufnahme seiner internationalen Karriere bereit, die allerdings von familiären Verpflichtungen vereitelt wurde: ein Umzug nach Argentinien war erforderlich (wo er Leiter der Abteilung für Klaviermusik an der Fakultät für Musik der Universität Tucuman wurde). Im September 1949 zog er zu einer Stellung als Komponist und Professor für Klavier an die Florida State University, Tallahassee. Sein letzter Auftritt auf den Britischen Inseln geschah 1956 in Verbindung mit dem Edinburgh Festival, wenn auch sein Einfluß weiterhin wahrnehmbar ist durch die Musikergenerationen, die das Glück hatten, bei ihm studiert zu haben. Zu diesen gehören Sir Georg Solti, die Pianisten Annie Fischer und Geza Anda und sein eigener Enkel, der Dirigent Christoph von Dohnányi. Dennoch war es Dohnányi, der, wie Bartók bemerkte, seinem Vaterland Ungarn sein einst so stolzes musikalisches Erbe zurückgab, indem er die Werke anderer über seine eigenen stellte und damit wahrscheinlich sein eigenes Schicksal als Komponist besiegelte.